Jean-Baptiste Jung (of WpRecipes and more) had twitted question about font used in logo earlier today. 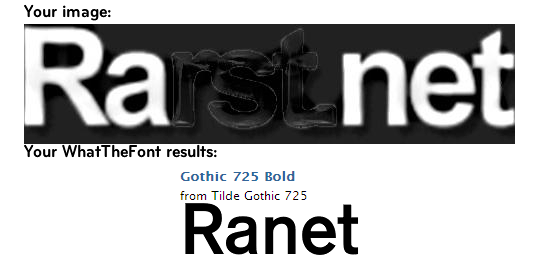 I was bored and quite sure I heard about services that determine font name by its looks so googled around and came up with WhatTheFont service from MyFonts site. WhatTheFont asks to upload (or provide a link to) image with characters of font you want determined. the more distinct letters the better. After that service tries to guess characters, allows you to make corrections and uses data to propose matching fonts. To try it I took my own logo ugly generic pic that acts as eternal logo placeholder, readers keep bashing me about (I had nightmares when even underused Skribit widget got “I really like the new design of you site. A logo would complete it :)” suggestion). Since it is smallish I edited it with Paint.NET to remove tagline and make letters larger. WhatTheFont skipped letters that were touching but even five remaining were enough to get four results with one of them almost completely identical (which is probably good enough for the task). No problem. :) Nice service and I should poke its site for some nice font I could use for logo update (don’t hold your breath, readers!) or whatever.